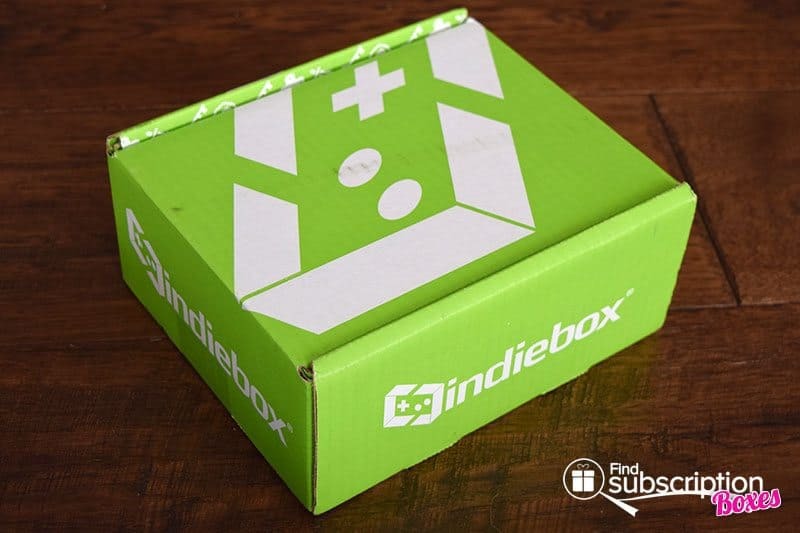 The IndieBox is a monthly subscription services for video game fans. 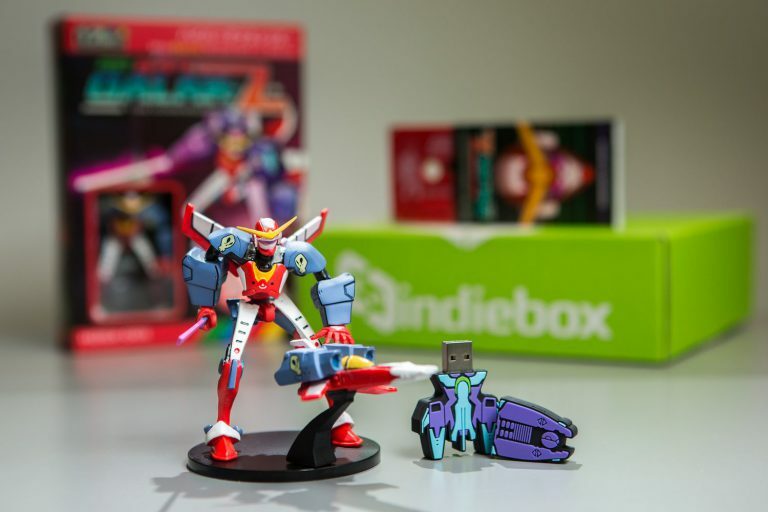 Every month, IndieBox subscription boxes deliver a limited edition version of a new or classic video game. With today’s IndieBox review, we’re unboxing the March 2017 IndieBox. 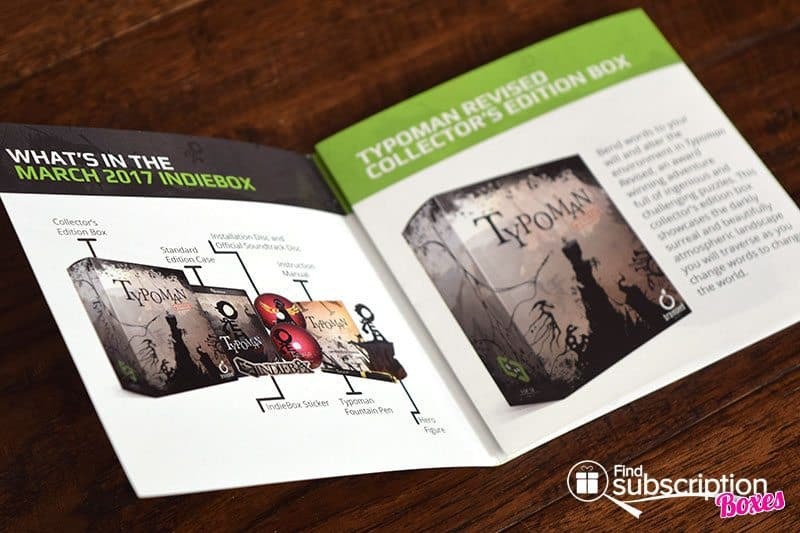 The March IndieBox game was Typoman Revised by Brainseed Factory. IndieBox includes a small brochure that describes that month’s video game and the gamer collectibles in the box. Here’s a first look inside our March IndieBox. 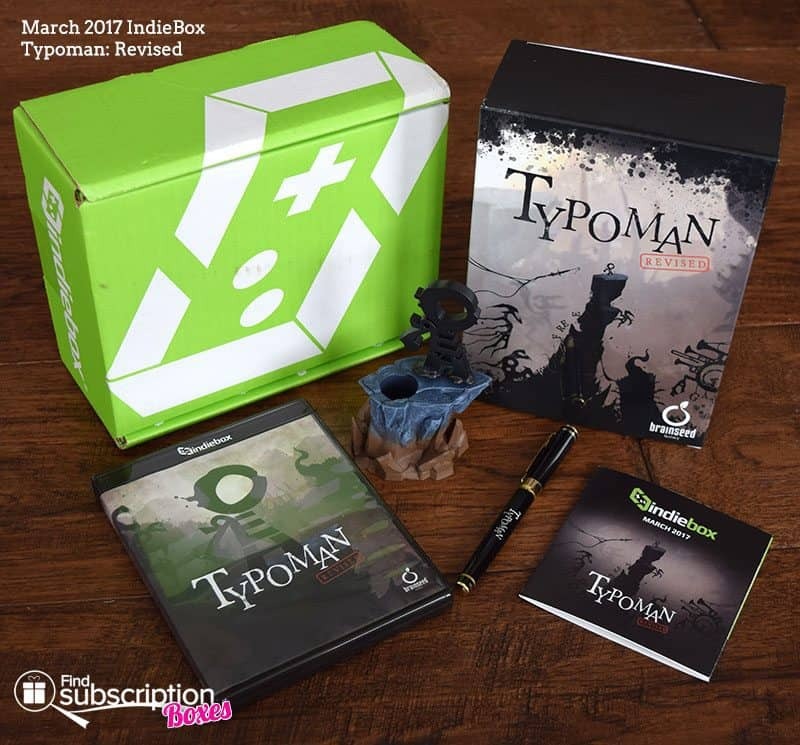 There was 1 video game and 2 collectibles in the March Typoman Revised IndieBox. Dispel evil with the power of words, or just see what you can spell with the Typoman Revised Standard Edition case. Contains a DRM-free installation disc official soundtrack dis, instruction manual and IndieBox sticker. Take on the dark creatures of oppression and tyranny, also known as your daily tasks, with this Typomnan Revised fountain pen. HERO is ready to stand tall on your desk and display your new fountain pen. 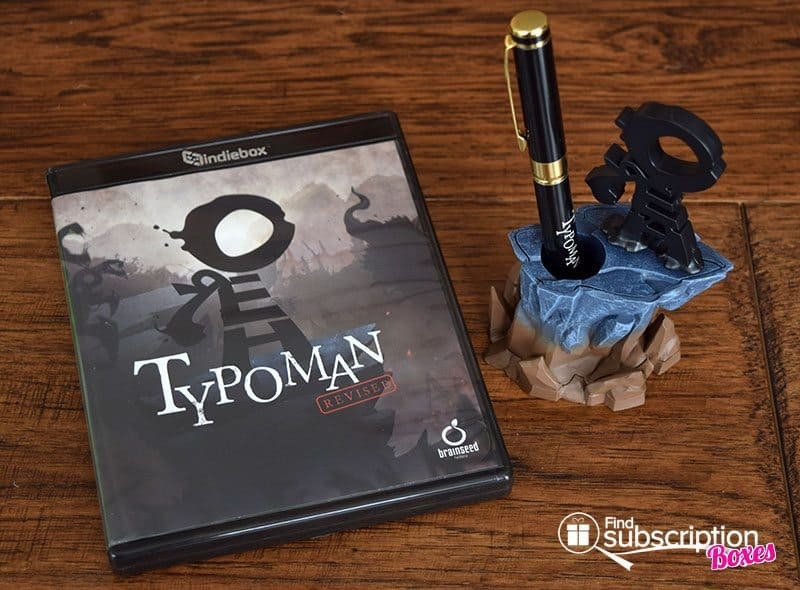 Typoman: Revised by brainseed factory is an additive game that challenges you to solve puzzles through word scrambles. The map has different obstacles and bosses that can only be “beaten” by using the provided letters to create words that solve the problem. For example, if you have a Gate blocking your way, you would use the letters to make O-P-E-N. We were surprised at how quickly we became addicted to the game. The map obstacles – like cliffs, falling rocks, and jumps – are challenging without being frustrating. Here’s a quick video of us working our way through Chapter 1. The scenery has artistic 2D backgrounds that provide an ominous feeling to the game (you are in the battle of a battle between good and evil) and the soundtrack is equally haunting. The game is easy to play. You use the arrow pad to move and space bar to have HERO, your character, grab/move/push things. It’s really interesting how the game makers correlate the word with the puzzle you need to solve to advance in the game. 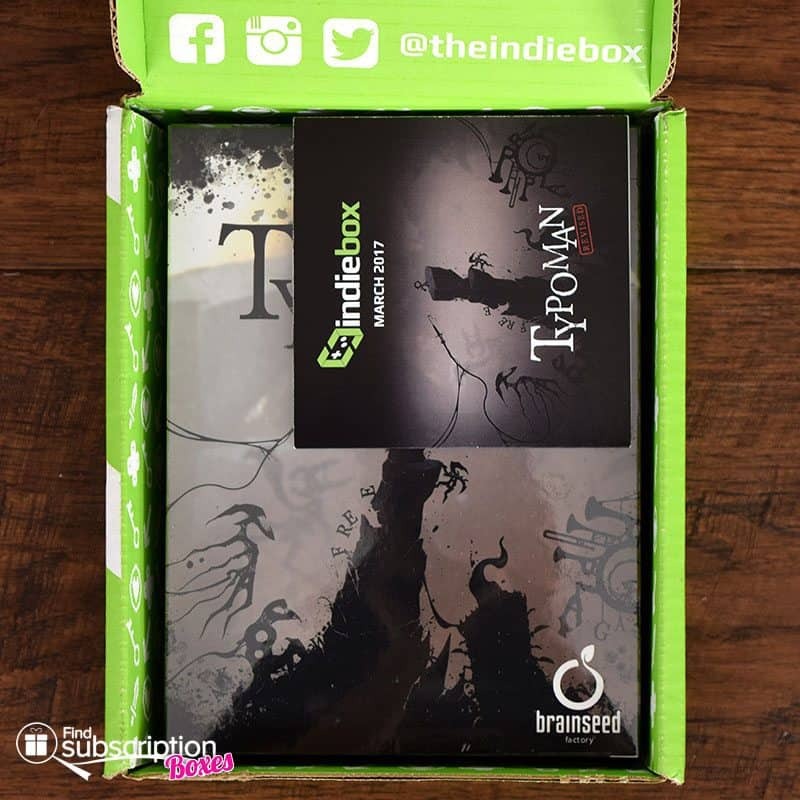 IndieBox is a fun way for true gamers to build their video game collection. We love that you’re introduced to a new video game every month so you may discover a new favorite game you might not have considered playing before. The collectible items are a great addition for gamers as well. The Typoman fountain pen and the HERO figure holder are really unique and are perfect desk accessories. What did you think of the March IndieBox? How would you rate IndieBox ?